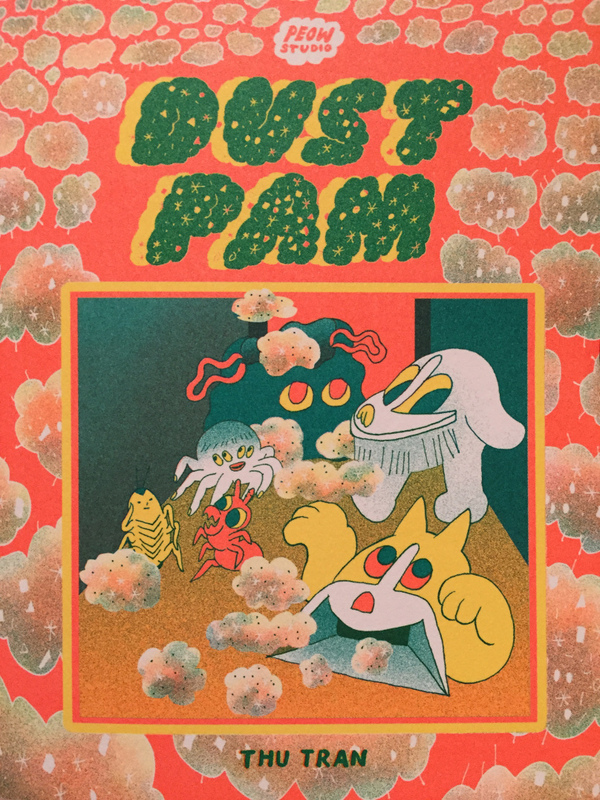 Dust Pam is the latest comic from the folks at Peow, and this one’s a doozy. It’s a compact 72 pages, printed in neon ink and perfect bound. The comic features a feline dustpan named Pam who works at Best Snacks Factory, some cleaning-supply friends, and a trio of irritating bugs that Pam desperately wants to get out of her house. The author, Thu Tran, is probably best known for her surreal cooking show Food Party on IFC. Some of the strengths of that creative endeavor have bled into Dust Pam, which has a startlingly clear vision of itself. It’s hard to describe the movement of the book as “plot,” which implies some sort of causality between the scenes in the book. Most of the action seems random, although ultimately motivated by Pam’s desire to have a clean house. Pam watches another cleaning product’s kids (shipped to her house in a faux-Amazon box, natch), invites a roomba and a mop to her house, and makes a bug trap out of cheeze dust and a pitcher plant. The the story jumps around from idea to idea in a way that feels more stream-of-consciousness than designed. 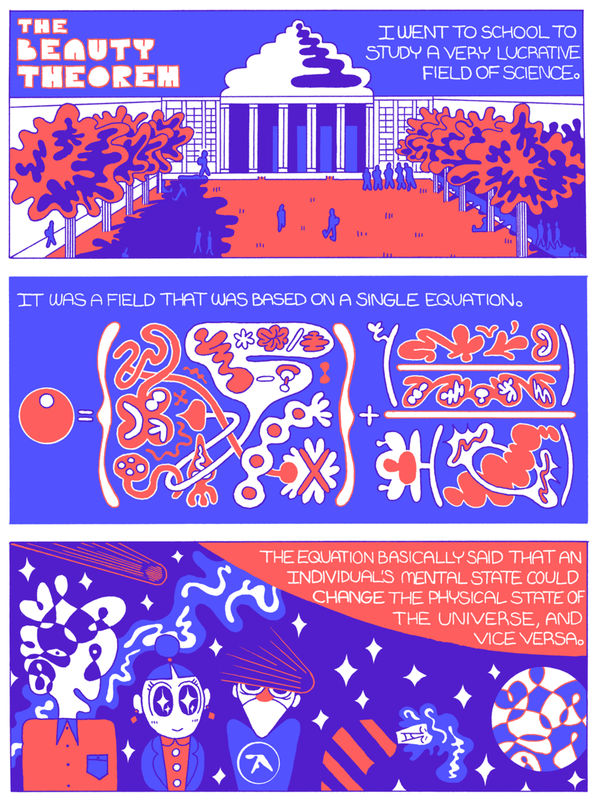 But it’s that freedom from the constraints of “X so then Y so then Z” that make Dust Pam so fun. Without the need to adhere to some structure of a plotline, Tran gets to throw a lot of individual ideas into a larger battle of dust pan vs irritating bug. Tran gets away with some of this directionlessness because of her charming cartooning. Dust Pam is loose and playful, and falls between the broad categories of cute and weird. (Like, for example, the spider in the comic has finger-legs with toenails that it chews off?). It can be a bit much, a little too saccharine at times. But there are a few truly funny bits and more that are ultimately amusing. There’s a good mix of those two major qualities, and it doesn’t veer in either direction for long. The color choices have a sort of eye popping quality. 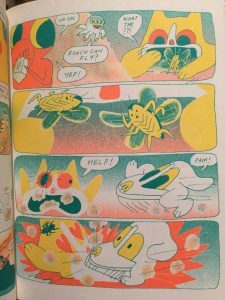 Tran & PEOW have had the book printed in fluorescent pantones, which make it feel like you’re staring at a lightning strike when looking at it. The book doesn’t photograph well, and it doesn’t scan at all. It’s something you’ll have to see to understand. That’s sort of a downfall of the online capitalist system small cartoonists and publishers find themselves in; the book isn’t able to accurately be represented in a JPEG on the internet. Its pictures on the PEOW website are positively washed out in comparison to the real McCoy. As an exercise in storytelling Dust Pam is going to leave some readers out in the cold. It’s just random stuff happening, without much in the way of direction. But the book is a fever dream, a surreal experiment in color, and a fractured burst of manic light. 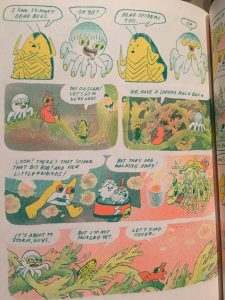 In a post-Adventure Time landscape, small press comics continue to push the line between cute and strange. There are books that rise above that soggy median; Dust Pam is certainly one of them. 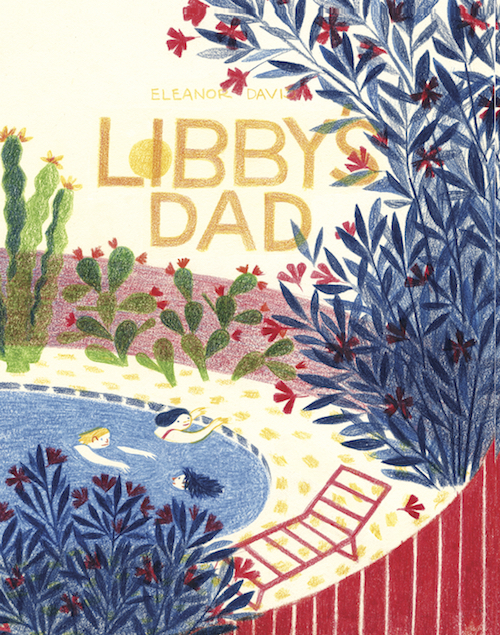 You can see more of Peow’s catalogue here. You can see reviews of other Peow books I’ve written here. Thanks for stopping by – if you liked this review, please consider supporting Sequential State on Patreon!